The boys and I saw something really neat today. 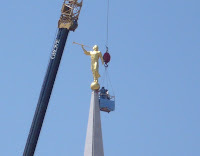 A friend came over to get a haircut and he said that on his way over he had seen the Angel Moroni on a crane being lifted up onto the top of the new Oquirrh Mountain Utah Temple. I quickly cut his hair, grabbed the boys and we drove up the hill to the temple site. Sure enough, there was the Angel Moroni, now resting on the steeple of the temple. Workers were still working to attach the beautiful statue. Jack repeatedly told me "that when Jesus comes back to earth the Angel Moroni is going to blow his horn so that we know he is here." He also reminded me that both Grandma Coral and Grandpa Henry will be able to come alive again. The things he has been catching onto are wonderful. We have enjoyed driving by the new temple so often and seeing its progress. It sure was a great thing to see and I feel so lucky to be so close to all of these temples.